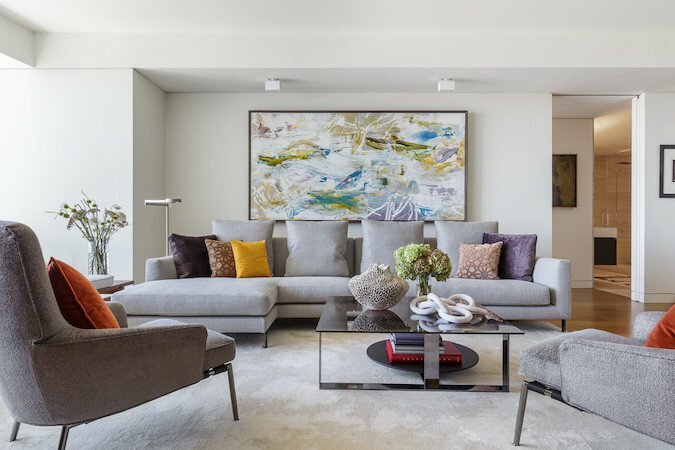 Incorporating your art collection into a new space can be a daunting task. Our clients, a family of three, had this exact problem when they moved into a newly renovated townhouse. Their bright, bold artwork felt foreign in an all-white space. And so they asked us to reconcile their existing collection, while also creating a space that could accommodate their two dogs and newborn child. A dramatic entrance was a top priority for our clients. With little in the way of a foyer, we knew that the dining room needed an opulent design scheme. 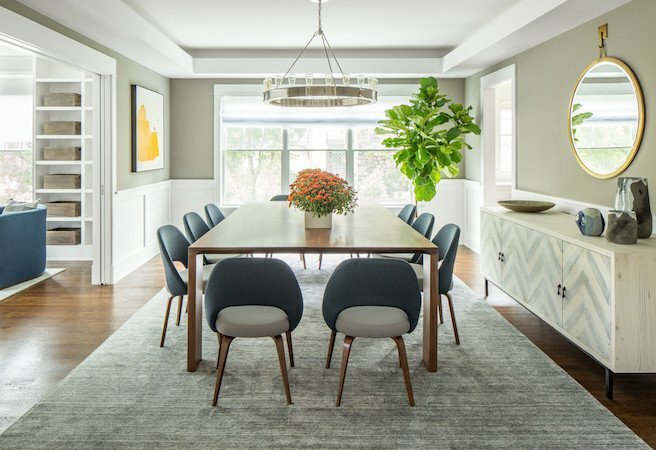 Dining chairs and a dining table from B&B Italia were placed underneath a Lindsey Adelman chandelier. And to highlight the client’s eclectic collection of dinnerware, we custom-fabricated polyform shelves, which feature brass accents and amber underlighting. Distinguishing the common spaces while maintaining a cohesive flow proved to be the biggest design challenge. To differentiate the formal area from the rest of the home, we custom-fabricated a circular area rug. 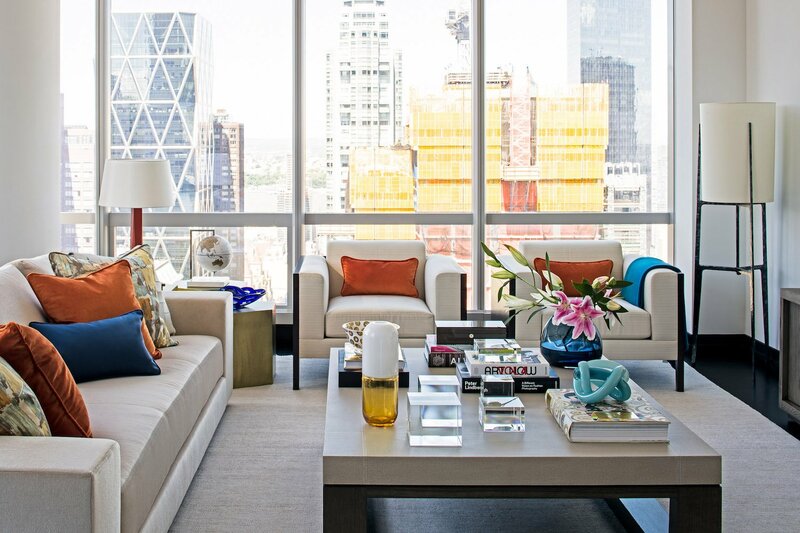 Blue and orange accents were woven in, to reference and compliment one of the client’s existing art pieces. A curved sofa lines the perimeter of the area rug, sectioning off the formal area without disrupting the apartment’s welcoming vibe. To counterbalance the light-filled common area, our clients asked us to create a powder room with a dark and intimate feel. So we fabricated a dramatic built-in wall unit. Gold trim and backlighting give the geometric walnut pieces a futuristic quality; black marble floors tie together the powder room’s opulent look. 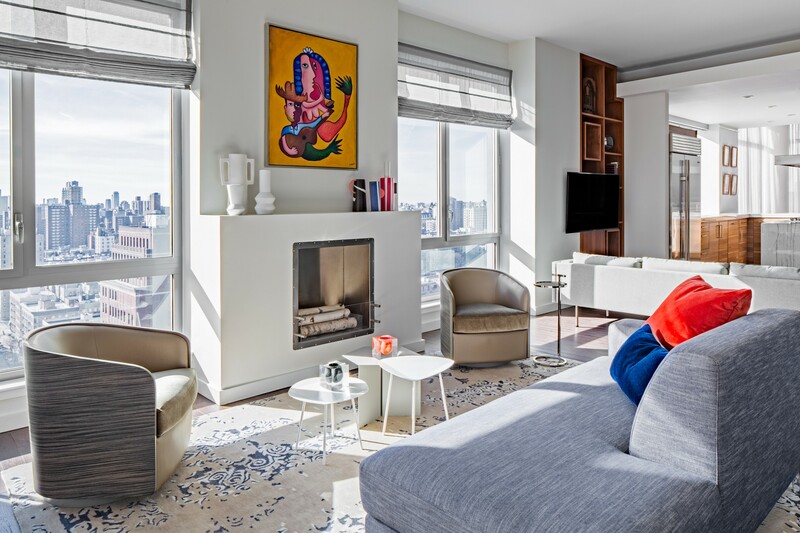 Finishing touches include a custom chandelier from Cliff Young, and sconces from Artemide. 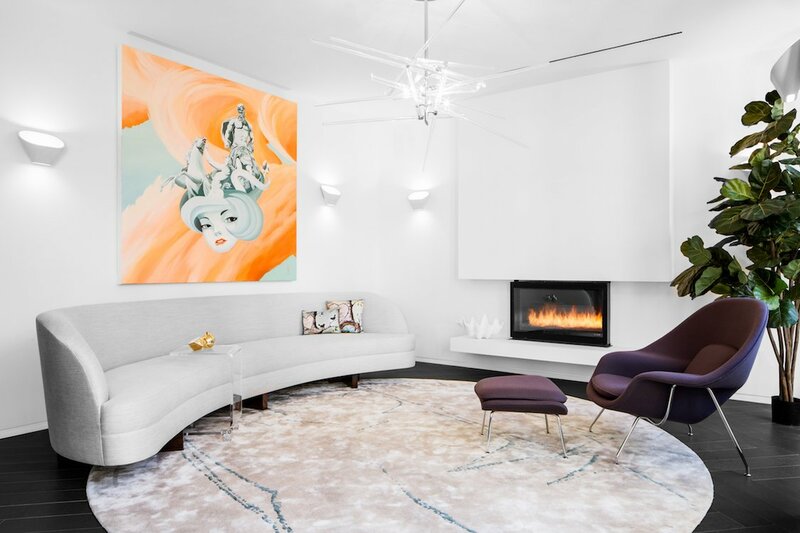 The final result is a modern, opulent, and colorful townhouse for this young family of three.